I want people to understand what life was like for ordinary people and especially children during that time. That generation of war children just took the abuse and after the war ended, everyone was in a hurry to move on. Nobody gave those kids a second thought. And so they sucked it in, grew up and created lives as best they could. In later years they were still accused of being Nazis because they happened to live at that time. In addition to the war theme, Lilly’s personal struggle with the betrayal of her father and boyfriend show us how complicated love and family relationships can be. Nothing is cut and dry, black or white. 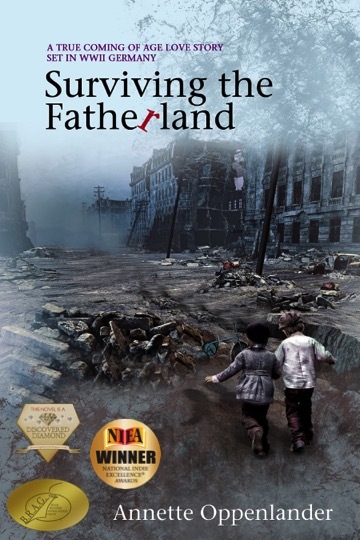 Surviving the Fatherland is based on the true story of my parents growing up during WWII, so the story is told from their alternating viewpoints. During my childhood, I’d hear bits and pieces, quick references or watch my parents nod at each other in silent understanding. As my interest in history grew, my curiosity grew with it. So in 2002 I asked my parents to share their stories. I spent several weeks visiting them in Germany and recording their memories. I remember one afternoon we were in the basement while my mother ironed. I’d ask questions and she’d tell me about the way her mother treated her. I still have those tapes though it’s hard for me to hear my mother’s voice. She passed away in 2004. “But that’s in three days.” Mutti picked up Burkhart, my little brother who was just a toddler and had begun to whine. “It’s fine,” she soothed as she paced the length of the kitchen, the click-click of her heels like an accusation. “Will you be back soon?” I tried again. He patted my head and returned to his chair at the head of the table. “I’ll be home before you’ve found time to miss me.” As he began to whistle, something nagged my insides like a tiny clawing animal. A screeching wail erupted. Sharp and metallic, it cut through doors and walls and echoed through the streets. No matter that the siren blasted every day, it made me shiver. I watched my mother freeze, her eyes filled with something I would soon learn to recognize as fear. The siren continued—up, down, up, down. Another wail erupted. This time it sounded like the foghorn of a ship, signaling the end of the alarm. “Not now, Lieselotte, we are talking,” Mutti said. I looked up in alarm. Mutti had said Lieselotte when everyone called me Lilly, a sure sign she was mad. I slid back off, keeping my hand on Vati’s arm. “Yes, Mutti.” I clumsily scrubbed the surface, glancing back and forth between my parents. Vati’s eyes, usually a watery blue, sparkled like an early morning sky. Hearing my parents argue made my insides turn knotty. I wanted them to stop, yet I finished cleaning and said nothing. All I did was return to Vati’s chair as their arguments continued flying like knives above my head. Vati got up and patted Mutti’s back. “Don’t worry, everything will work out fine. During dinner, I continued watching my parents. Heavy silence lingered except for my brother’s babble and the scraping of spoons across porcelain bowls. I didn’t taste much of the soup. My eyes were drawn to the stony faces on either side as I recalled the events of the afternoon, wondering if I had done something to make them angry. In that stillness of the kitchen, I sensed that my life was about to change. Something dreadful lingered like a wolf lying in wait behind a bush ready to pounce. You didn’t see it or hear it, yet you knew it was there. “Tim says that women who wear lipstick are whores,” I said, my gaze lingering on my mother’s mouth where the remnants of lipstick clung to her lower lip. “Who is Tim?” Mutti snapped. “Young girls like yourself are pretty just the way they are,” Vati said. I was sure Tim had talked about all women and though I burned to know what a whore was, I decided to keep my mouth shut. My teacher’s probing eyes appeared in my vision, and I remembered my earlier mission. “Vati, will you read with me tonight?” I was a terrible reader, hated it, especially when I had to read aloud in class and Herr Poll slammed his ruler on my desk when I got stuck. “Attention! Feet together, arms down, hands at your pant seams. Look straight. Stand still,” the boy shouted. He was no more than sixteen, and the khaki uniform hung in folds around his narrow chest. The hair around his ears, shaved to the skin, left a tuft of blonde on top like a bird’s nest. I stood next to my best friend, Helmut, at the sports stadium where the local Hitler youth met for drill. We’d lined up in rows of three deep in the middle of the grass-covered field. Another boy with red and blue patches on his shirt appeared in front of us. From the corner of my eye, I watched Helmut adjust his shirt and rub his shoes. Helmut sometimes forgets about these things. Thankfully my own socks stretched to just below my knees. Still, I held my breath as the boy passed by. Earlier today we’d bought a uniform: black shorts and beige shirt, neckerchief with leather knot, armband, and the best part, a brand-new knife. Mother had grumbled about spending so much money. “But Mutter, all boys have to go,” I’d argued after we left the store. “They told us at school. It’s our duty.” I didn’t tell her how excited I’d been about my new outfit. Most of the time I get the hand-me-downs from my older brother, Hans. “What’re they going to do with you?” she’d said, her voice stern with irritation. “Make fires and camp.” I didn’t tell Mother that I couldn’t wait trying out my new knife and going on adventures with a bunch of boys. Now I waited in a line and couldn’t move a muscle. Stupid. “Attention! Turn left, march! One, two, one, two, follow me.” Birdsnest headed down the field while the other youth observed, waiting for us to trip and fall out of line. We marched back and forth, left and right, crisscrossing the field. What a bore. The air smelled of early summer and warmth. Dandelions and forget-me-nots dotted the grass like a colorful carpet. Imitating my classmates, I fought the urge to look around, keeping my head straight toward the horizon as if I could see what was coming a mile away. A man in a brown uniform with a red armband watched from the sidelines. Distracted for a moment, I stepped on the heels of the fellow in front. “You’re the idiot. Why did you stop?” I said. “He stepped on me,” the other boy said. “Yes, sir.” I hurriedly dropped to the grass and hid my face because my head had turned into a super-heated balloon ready to fly away. With the youth’s flag for freedom and bread. Yes, the flag is more than death. Birdsnest continued reading from his book about becoming heroes, but my thoughts, sped up by the gnawing in my stomach, wandered to the dinner waiting at home. On dismissal, Birdsnest gave me a nasty look before reminding us to practice marching and standing to attention. He never mentioned camping or making fires. Boring. We weren’t allowed to use our knives either. Worse, we’d have to go again Saturday. By the time I arrived at my house, it was late and I was in a rotten mood. Helmut is much more of a talker, but he was grumpy, too, and we’d walked home in silence. I lived on the first floor of an apartment house on Weinsbergtalstrasse, one of a row of identical three-story homes. Recently built of brick and stucco, they were considered modern, each house painted the same pale green except for an occasional flower box in a white-framed window. I loved our new water closet. You pulled on the chain, which I was strictly forbidden to play with, and the water released from a tank under the ceiling, flushing everything away. Helmut still had an outhouse. The words stuck in my throat because the table, set for five, was untouched, the room deserted. A sense of unease crept up inside me, quickly forgotten because of the delicious smell emanating from the cast-iron pot. I lifted the lid and let out a sigh: bean soup with ham and smoked sausage. I glanced at the clock, seven-thirty. No wonder I was starving. We never ate later than six. Something was wrong. Reluctantly, I turned away from the soup and tiptoed down the hallway. Voices came from my parents’ bedroom. Mother sat hunched over on the bed, my father kneeling in front of her. I wanted to enter, but something in their expressions held me back. “What do you mean?” I looked back and forth between my parents.